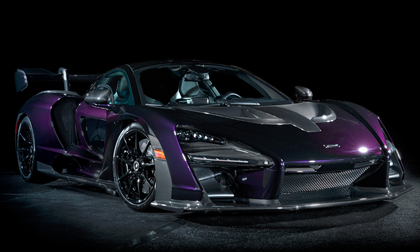 SCOTTSDALE, ARIZ. – Jan 16, 2019 – Barrett-Jackson, The World’s Greatest Collector Car Auctions®, announced today that it has added one of the rarest supercars, a 2019 McLaren Senna (Lot #1405), to its 48th Annual Barrett-Jackson Auction at WestWorld of Scottsdale in Arizona. Inspired by one of the world’s greatest racing drivers, Ayrton Senna, this 2019 McLaren Senna boasts a prized serial chassis number of 005 out of only 500 vehicles, and is one of approximately 120 in the United States. Powered by a twin-turbocharged 4.0-liter V8 engine that makes an astonishing 789bhp and 590 ft/lbs of torque, the sensational Senna is capable of 0-62 mph in 2.8 seconds – and 0-124 mph in 6.8 seconds. The two-seat, carbon-fiber supercar comes with the performance upgrades of a race car, including oversized carbon ceramic brakes, active chassis control suspension, a 7-speed dual clutch Seamless Shift gearbox and advanced aerodynamics. With 800 horsepower behind you, 1,764 pounds of downforce above you, and an active suspension below you – the McLaren Senna offers the same chest-crushing, acceleration and face-distorting G-forces similar to flying a Lockheed Martin F-35 fighter Jet. For more information on becoming a bidder, follow the link to http://barrett-jackson.com/bidder/home. Experience the 48th Annual Scottsdale Auction in style with a Barrett-Jackson VIP Experience Package. Information on available packages and how to be a part of this world-class lifestyle event is available here.